What a day with the Better Lives partner team in Cambodia! 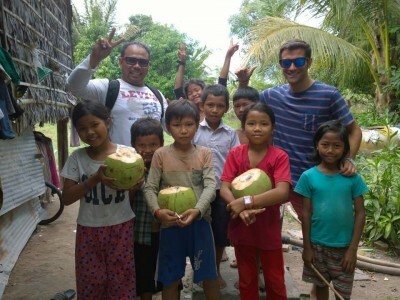 We were lucky enough to catch up with Rey, manager of the Peaksneng Thormacheat Shop (PTS), while visiting Siem Reap and the Angkor temples on a recent trip. Rey was kind enough to show us the programs that they have going on in Peaksneng (35 km from Siem Reap) and to introduce us to some of the participating families as well as to the PTS team. After a casual meal together in Siem Reap the night before, Rey came to find us at our guest house the next morning. He helped us rent an automatic motorcycle from a shop down the road and then we were off! We followed Rey out of central Siem Reap and not many kilometers later we started to see the real Cambodia which is VERY different from what you see in Siem Reap with its bright lights, international restaurants and loud touristy bars. Here you see people living in very modest conditions out in the countryside. After less than an hour of keeping up with Rey who doubles as a pro motorcyclist (! ), we arrived at the CC family home. We were welcomed by the infectious laughter of the children and fresh coconuts that they cut down and shared with us. That afternoon CC and his wife were planning on rehauling the garden for planting new crops in their modest plot of land. 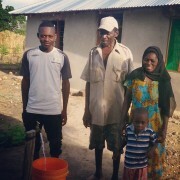 We learned that Mr. CC was inspired to improve his family’s situation after seeing how his brother and his family expanded their vegetable garden and thus earned a better income and consistently had enough food to eat – something the CC family was unfortunately lacking previously. After a quick visit, we then rode off through the muddy country roads to see the MSO/OM family. 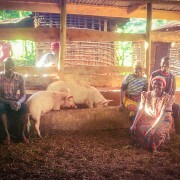 Here we met an extremely hardworking grandmother who was working with her mute daughter to provide a better life for the grandchildren. We were extremely impressed by their bountiful garden which has taken them a long way over the last few years. Through their hard work with the garden, the children eat healthier and the family has more income for sending them to school. It was great to catch them dressed in their uniforms and with their backpacks on ready to go to school! 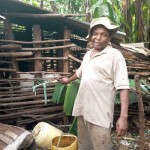 We also saw their improved home which they were able to build thanks to the PTS team and community. 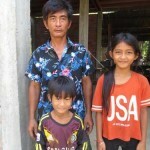 It was lovely to chat with the family and the kids thanks to Rey who speaks Khmer and can translate for us! After seeing so many delicious vegetables at the homes, our stomachs were rumbling and ready for lunch! It turned out that Rey organized a team lunch at his place located at the main PTS farm. 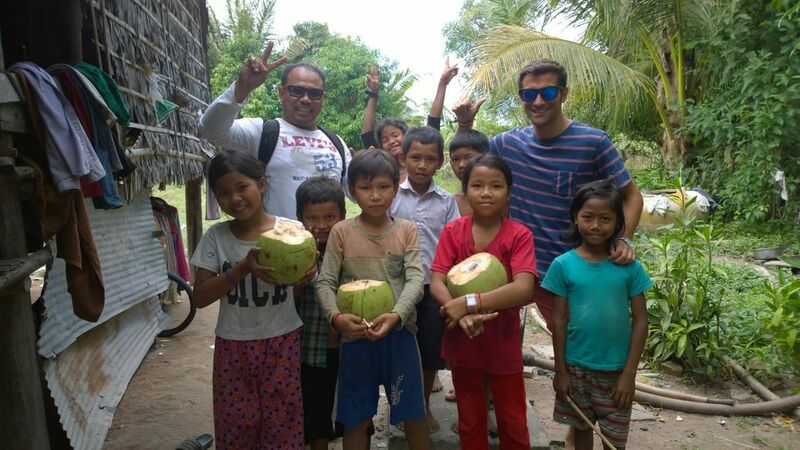 When we arrived on our motorcycles, the team had already prepared some delicious BBQ, rice and vegetables for us to eat together under the shade of Rey’s stilted home on the farm. Again with the help of Rey’s translating we had some laughs and were able to chat with them and understand that they had been busy helping families prepare their organic vegetable gardens and providing mentoring services when needed. 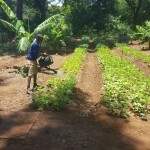 They were also applying the organic gardening principles in their own homes and seeing positive results in terms of having healthy food on the table and extra income to buy piglets/chickens and improve their homes. One of the team members, WMT, had actually just entered his new rent-to-own home which he was very pleased about. After finishing some lunch, Rey showed us around the pilot farm which they also work on to be able to sell organic vegetables with the aim of achieving financial self reliance. The team was looking forward to spending more time on the pilot farm and growing even more organic mangoes among other things! 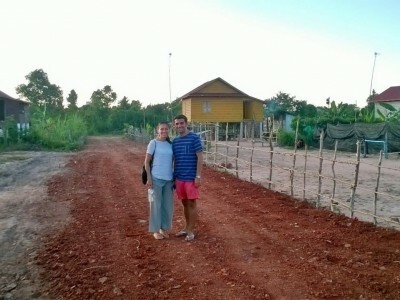 Before driving back to Siem Reap, we stopped by the rent-to-own community where WMT was moving in. We saw 7 sturdy homes with different personal touches depending on family preferences (bathroom/kitchen placement, etc.). The families looked proud of their homes and gardens and we saw the amount of land still available for future homes as well as space for playing sports and future store fronts, eateries and accommodation for visitors. It’s an exciting time to see how this program develops! As the sun started to go down we got on our motorcycles to drive back to Siem Reap. At this time of the day you can drive through the Angkor sites without a ticket so we were lucky enough to witness the sun going down behind the ancient temples and thick jungle as we drove past on our way to the city center. As if that wasn’t a perfect ending to the day, we topped it off with a drink in town with Rey!